Let us amaze you as your incredible journey to India unfolds. We have created a tour rich in Indian culture for those who are short on time. We begin in the big, chaotic capital city that is New Delhi. Ride a rickshaw through Old Delhi and get the sense and the feel of India as it was centuries ago. Then, find your hidden talent as we learn to dance Bollywood style! Next, we escape to the sandcastles of the desert where we’ll find India’s grand palaces and forts that are centuries old. Here, you’ll learn about the times of the Taj and the life of a Raj. Visit one of the architectural masterpieces of the world, the Taj Mahal, where you will not only be transfixed on the artistic gem, but on the love story that inspired it. 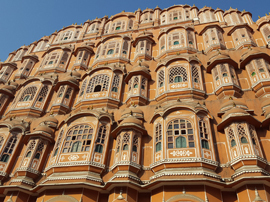 Finally, our tour will take you the desert state of Rajastan where we’ll visit the Pink City of Jaipur. 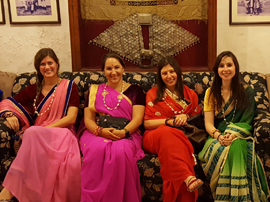 Here, you’ll have the chance to take part in a home hosted dinner, dressed in traditional Indian sarees. We’ll ride jeeps to the Amber Fort and spend time in the colorful buzzing local markets in this shopper’s paradise. For those who want to extend your journey, stay just two extra nights. You’ll fly to Varanasi, one of Hinduism’s holiest cities. Visit the Ghats on the Ganges River and experience a boat ride through the floating lamps placed during ritual ceremonies. 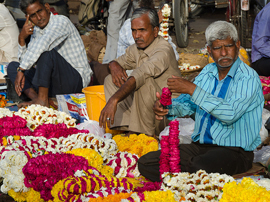 Our amazing tour of India will speak to you and touch your mind, body and spirit. Arrive at Delhi International Airport in the late evening/midnight. After clearing customs and formalities, our Amazing Journeys representative will greet you and transfer to you to our hotel. Welcome to India’s capital city. Contemporary Delhi is a bustling metropolis, which successfully combines the ancient with the modern. It was a magnet which drew the Mongols, Turks, Persians, Afghans, Mughals and the British, all of whom contributed to its glorious but turbulent past. Today, the twin cities of Old and New Delhi still intrigue Indians and tourists alike as the cultural and political capital of the largest democracy in the world. After breakfast and check-out from our hotel, we’ll drive to Humayun Tomb which was constructed in the 16th century and is a UNESCO World Heritage Site. It is a precursor to the Taj Mahal. We’ll continue to drive to Agra (approximately 4.5 hours). The Mughals, besides being great rulers, were also grand builders and they preserved their best architectural wonders for Agra and its surrounding neighborhoods. The area has many wonderful monuments and the Taj Mahal, the greatest of them all, is a masterpiece of Mughal architecture at its best. It is a UNESCO World Heritage Site. After breakfast we’ll check out of the hotel and visit Agra Fort, built in the 16th century. This fortress is made of red sandstone and is known as the Red Fort of Agra, which encompasses the Imperial City of the Mughal rulers. We continue our tour and drive to Jaipur, known as The City of Victory (approximately 6.5 hours), located in the state of Rajastan. Jaipur was founded in 1727 and is the only city in the world symbolizing the nine divisions of the Universe through nine rectangular sectors sub-dividing it. The city was painted pink in 1853 in honor a visit by Prince Albert of England and many parts remain that way today. Except for the busy traffic seen today by bicycles, cars and buses, little seems to have changed. After an early breakfast, we’ll take an excursion to the magnificent and palatial Amber Fort, located on a hill top. We’ll ride a jeep to ascend the fort, where we’ll learn about the history of the structure and the people during this time in history. We’ll return to the city and enjoy lunch at a local restaurant. A deposit of $400 is due with your reservation for the India tour. Final payment is due on October 1, 2018. Pre-Tour Stay in Delhi: For those who want to arrive prior to the start of the tour, we have a limited number of rooms held at our group hotel. Please note – there will be no Amazing Journeys staff present nor will there be programming on these days. We are not able to match roommates for extra night stays. Rate is $130 per person for double occupancy, $200 for single occupancy (includes taxes and breakfast). Items listed on this website are subject to change at any time. By providing payment you agree to the terms and conditions as outlined on this website. All hotel rooms are non-smoking where we provide roommate matching. Cancellation Policy for Tour Packages: From the time of deposit until July 5, 2018, there is a $100 penalty for cancellation. From July 6 – October 1, 2018, the cancellation penalty is the amount of the deposit for the tour and extension package. From October 2 – November 14, 2018, the cancellation penalty is 50% of the total for the tour and extension package. Cancellations made on November 15, 2018 or after and “no-shows” will receive no refund. There is no refund in the event of interruption or cancellation after the start of the tour. Proof of Citizenship: All passengers must present a valid passport (valid for six months beyond the last date of travel) for this trip. Visas are necessary for entry to India and more details will be sent to confirmed passengers approximately three months prior to trip departure. Please note that visa requirements may change at any time. Currency Fluctuations: In case of currency fluctuations greater than 3% on our pre-cruise package, we reserve the right to adjust our prices accordingly in order to operate the tour. Flights: International airfare is not included in the tour rate. Airfare should not be purchased until you receive your confirmation letter with specific flight parameters. Transfers: Airport transfers are included.